I’m so sorry to do this to you. I’m well aware it’s only October. 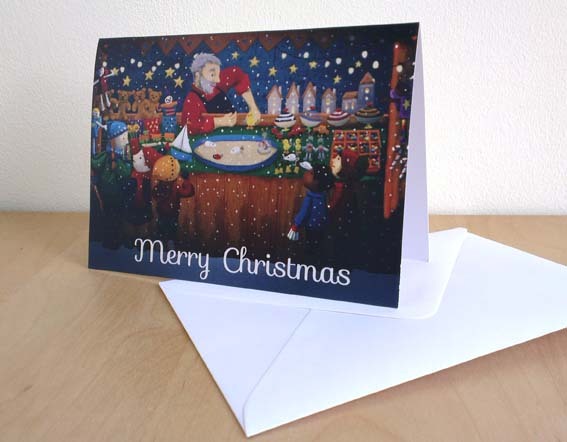 Here goes…Christmas cards! There I’ve said it. I’ve got Christmas cards to sell. The reason I’m posting about them now is because I will be seeing my mother-in-law over half term so I can pass on any northerly deliveries to her should any of my lovely regulars up there want any. The picture on the front is inspired by my sadness last year at there not being a wooden toy stall at the Christmas market we went to. Instead I decided I’d just have to draw one for myself to make up for it! They come in packs of ten, with white envelopes. I’m charging £6 per pack this year (plus postage and packaging should you require it) because in all my rush to be organised I failed to ask the printers to put a Christmas greeting on the inside, hence they are blank on the inside. Drop me a line if you would like a pack at: hannah@owlingabout.co.uk. I’ll blog about them again nearer Christmas for those of you who (quite sensibly!) can’t bear to think about the C-word just yet. 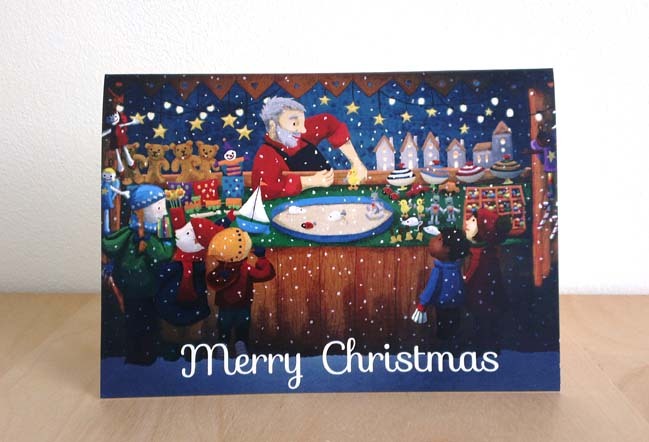 This entry was posted in Illustration and tagged cards, children, christmas, Hannah Foley, illustration, illustrator, lights, market, presents, seasons, snow, toy shop, toys, wooden. Bookmark the permalink. Actually I think your design is perfect with the white Merry Christmas on the front – you don’t need anything inside. I love the traditional feel of the market place with the wonder of the children & the one in the middle left gazing up at the dolls.